Membership – Welcome to the White Rose Figure Skating Club! 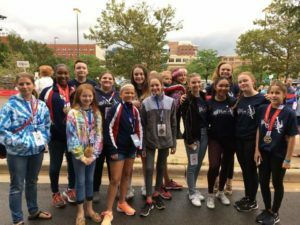 Members of the White Rose Figure Skating Club who participated at State Games of America 2017, in Grand Rapids, Michigan. Entitles skater to test, participate in shows, and use of club ice. Skater under the age of 18 requires Parent Membership. Entitles skater to test, participate in shows and use of club ice. Must present college ID card. Must have another club as home club. Required for coaching on WRFSC ice. Must present insurance certificate as well as current USFS registration. Required for one non-skating parent (or guardian) of each home club skating member who is under 18. Able to attend board meetings as a Club member. Entitles skater to test LTS USA only, participate in shows, and use of club ice. The preferred method for registration in the White Rose Figure Skating Club is through Entryeeze. The membership season begins July 1 and membership cannot be pro-rated. If you are considering joining late in the season, contact a board member to see if there are options to save on membership costs. If you join after May 31 you will automatically be renewed through the following year. Membership in White Rose FSC is open to all who are eligible for U.S. Figure Skating membership, and upon approval of the White Rose FSC Board of Directors. Memberships are not transferable. Skaters interested in joining can contact Sarah Blasser or any other board member or coach for more information.